"A pretty car makes an even prettier wreck." Profile: Runabout likes to watch things blow up; the bigger the explosion, the more he enjoys it. If he's not busy hunting Autobots, he'll pass his free time by using parked cars for target practice or igniting fuel pumps at a gas station. A good-sized fireball never fails to bring a mischievous smile to his face. Seemingly driven by an unending supply of evil energy, he avoids even the briefest lulls in activity as if he's terrified that boredom might fatally infect him. 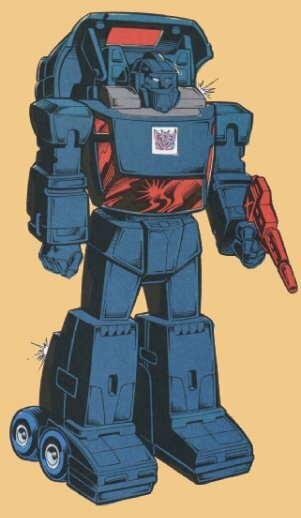 As a Battlecharger, Runabout gets more than enough opportunity to stay busy, but he worries about what he'll do with himself after he finishes blowing up all the Autobots, cars, and gas stations on Earth. He calculates at the rate he's going he'll have to find a new sport within two years. Abilities: In car mode, Runabout has a maximum speed of 185 mph and a range of 550 miles. He can transform to robot mode in .4 seconds. He uses a particle beam rifle that shoots a high-energy beam of neutrons with devastating results. Weaknesses: Runabout's attention turns to beautiful cars like a young man's turns to beautiful women. In Runabout's case though, the more beautiful the car, the more he craves to destroy it. This often distracts him from his true mission and leaves him vulnerable to attack.